The Logitech Keyboard Folio mini for iPad mini is well made, works a treat and does exactly what it sets out to do. If you want to type safe in the knowledge that there's on-the-go protection for your iPad then this stylish solution could well be the answer. Lovely. The iPad mini is great - we know that already - but when it comes to typing it's not so fantastic. Logitech believes it has the answer with the Keyboard Folio mini for iPad mini, a keyboard-meets-case design that turns your Apple mini tablet into more of a netbook-like offering. Is it any good? Logitech make two keyboards for the iPad mini. 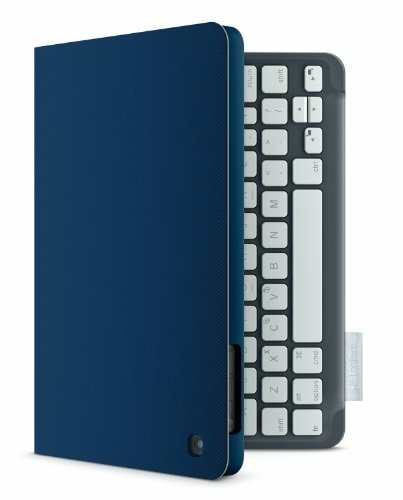 There's the Logitech Ultrathin Keyboard Cover for iPad mini and then the focus of this review: the Keyboard Folio mini for iPad mini. The keyboard element of both devices is identical, but the rest of the package is very different. The Ultrathin Keyboard Cover for iPad mini is an incredibly lightweight affair that snaps on to your iPad mini via magnets. It's just the keyboard, so there's no case-based protection. The Keyboard Folio mini, on the other hand, is a more complete keyboard solution that you're likely to leave on at all times. Slot the iPad mini into the Folio mini and the two fit like a glove. A very tight glove. Although it's not impossible to remove, extracting your iPad quickly isn't easy. It's best to just leave the two paired up for the duration as that's part of the point - and there's certainly little fear or doubt that the tablet will fall out at given any moment. The fit gives the mini a bound-book-like feel, in part due to the added bulk and weight that plump out the combined package. That said, the experience isn't to be sniffed at. The Folio mini's fabric outer looks smart - business smart - and we've received loads of positive comments while in various meetings. It makes a good impression. In use the case opens up like a book, but with a second fold that allows you to rest the iPad mini at the right angle to work from. Magnets placed in the case and at the top of the keyboard keep it from slipping out of position and it's sturdy enough to use in a variety of environments. For us that's meant on hard surfaces such as a desk, but also lap-based positions while sitting on the sofa, travelling by taxi, train and plane. In all situations the Keyboard Folio mini's case worked just fine and the small size of the iPad mini makes it an ideal on-the-go netbook-like experience. The case can fold back on itself if you want to use the iPad in a more traditional tablet way with the soft keyboard on screen, although don't forget you will have all the extra bulk of the keyboard and the case to go with it. A fatter mini. When it comes to typing Logitech has packed in a 20cm-wide Qwerty keyboard into Folio mini's design. Compared to a full-size standard Qwerty keyboard on a MacBook Air, for example, and there's 7cm less space but the Folio mini still opts for the majority of keys. The keys themselves aren't minuscule, yet they're not that big either. They have good "travel" and "clickability" for a positive-feedback typing experience. So long as you get the right key that is. There are raised markers on the F and J keys for touch typists, but we think it is more to do with the keyboard stretching beyond the iPad mini's screen area. In the Folio mini's design Logitech has still managed to feature the four arrow keys and a series of secondary keys accessed via a function (fn) key. Here you get access to lock screen, Siri, search, browser, on-screen keyboard toggle, photos, media playback and volume control. It's the full whack of shortcuts. For the first couple of days we found our typing slightly offset, but then your brain adjusts and it comes naturally. Having used Logitech's Ultrathin Keyboard for some time before swapping out for the Folio mini we felt right at home with our tapping fingers. Then there's the promise of longevity. Logitech quotes a six-month battery life from a single charge of the built-in battery and while we've not been using it for that long yet, in the past month that we've been tapping away we've had no battery issues whatsoever. The Logitech Keyboard Folio mini for iPad mini is a much more complete package than the Logitech Ultrathin Keyboard. When we first started using the Ultrathin we were keen to have something that encased the iPad more - but now we've got that in the form of the Folio mini we aren't 100 per cent on side, mainly because we still like using our iPad mini as just a tablet rather than a bulkier netbook-like replacement. The added bulk is the one thing that might throw the Folio mini's appeal out of the window, but then that's a given in almost any case design. If that doesn't bother you then this will be your perfect device. If you're looking for a simple clip-on keyboard then we'd suggest looking elsewhere. Of course the Folio mini case does come off, but it's a fiddle due to the tight fit. Overall, and for what the Folio mini is, it's really rather good. This is a well-made, good-looking add-on that transforms the iPad mini. If you want to type on the go, while being safe in the knowledge that there's added protection for your iPad mini to boot, then this stylish solution could well be the answer you're looking for. Lovely stuff.